British fascists plan to destroy Israeli flags and burn Jewish religious texts during a march in northwest London next month, it has emerged. Organizers of the July 4 demonstration plan to march against the “Jewification” of Britain in Golders Green, a traditionally Jewish area known for its Orthodox population. He also said a private ceremony would be held where copies of the Talmud, a Jewish holy book, would be burned. Bonehill-Paine, 22, said Israeli flags would be destroyed in solidarity with those “oppressed” by the “illegal" state. In northeast England, police in Newcastle upon Tyne in March arrested two neo-Nazi activists for burning Israeli flags at a small far-right demonstration in the city center. The “White Man March” was organized by the small, but social media savvy neo-Nazi group National Action. Mark Gardner, a spokesman for Community Security Trust (CST), a Jewish charity that monitors anti-Semitic hate crime, told RT that the community stood defiant. “Our intention is that it should not damage the life of our community on the Sabbath,” he added. Speaking to the Jewish Chronicle, Gardner said Bonehill-Paine’s planned protest comes in the wake of a similar neo-Nazi demonstration in London last month. Shomrim, the Hebrew term meaning “guards,” are neighborhood watch organizations established by Orthodox Jewish communities in the US and Britain. Bonehill-Paine claimed that London Shomrim groups had invited far-right activists to patrol with them. But Shomrim representatives “categorically denied” any contact with the fascist march’s organizers, according to the Jewish Chronicle. 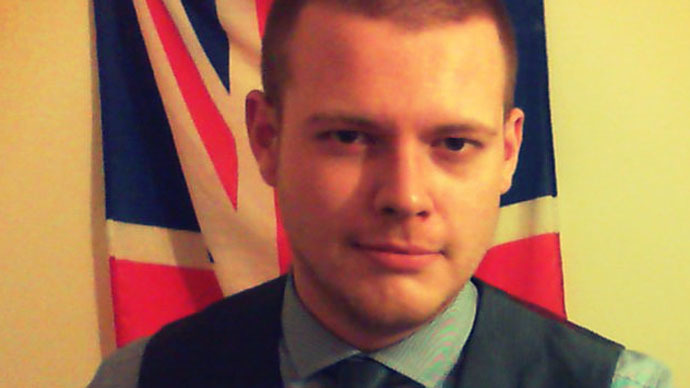 Bonehill-Paine has previously been arrested for his online activity, which includes sending anti-Semitic tweets to Luciana Berger, Labour MP for Liverpool Wavertree. The far-right activist was labeled an “internet troll” by prosecutor Dafydd Paxton in 2014 after he was charged with sending malicious messages online.